Stories of Scale is a content series with startup participants from our conference in a partnership with EQT Ventures, sharing growth stories and lessons from industry insiders centered around four pillars: technology, business, human optimization, and communication. Are you savvy enough to identify a counterfeit work of art? Do you know which paintings are most likely to be a solid investment? At the most recent TNW Conference, we spoke with Petr Václavek, the VP of Global Marketing and Communications for Artstaq, where he shared some of the challenges facing the auction business within the art industry. When it comes to trading or investing in art, being well informed can provide you with key insights into the industry. Consider having the opportunity to invest in an artwork and having to choose between a piece by Pablo Picasso or Andy Warhol. Could you select the most stable investment? By combining ratings collected from a network of art experts with real-time market data, Artstaq makes the art investment industry much more transparent for art buyers and sellers. With a data-driven approach, Artstaq launched a public dashboard on its website. Based on their ratings, Pablo Picasso’s paintings bring him to an astounding 10/10 for Artistic Quotient (AQ). This unique metric compiles dozens of data points and offers a unique evaluation of an artist’s work. Putting this into perspective, Andy Warhol scores 9.5, and Damien Hirst holds a score of 7.8 out of 10. The company collects a variety of data points to calculate the unique metric. From the last trading price and the amount of press coverage it has received to the market value, users can apply filters to the dashboard. Václavek, VP of Global Marketing and Communications for Artstaq, compares the metric to something more familiar: “We like to say that AQ is an artist’s IQ in other words because it speaks about his quality, integrity, history, and future development. We are seeing the complete history and are able to predict the trends as well”. Driven with a mission to empower collectors and artists around the world, Artstaq aims to be a sort of NASDAQ for art. 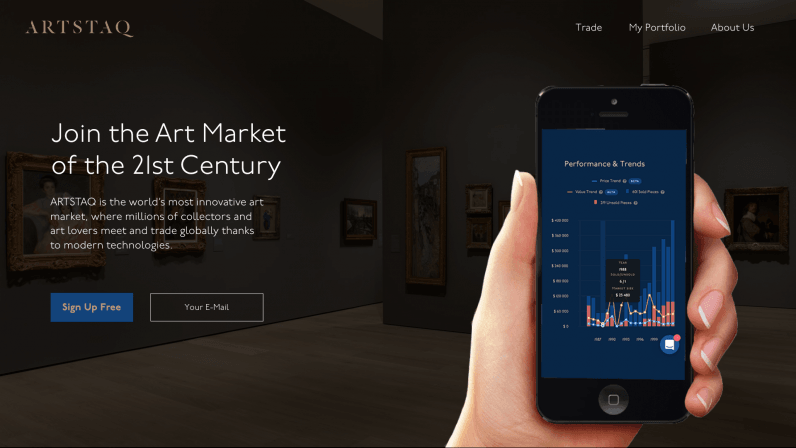 From the style of the artwork to press coverage, real-time growth, and market value, a wide variety of data is collected to make it easier for people to invest in the art industry. With reliability concerns plaguing the art industry since the introduction of the art exchange, some digitization is certainly welcome. According to claims made by experts from the Fine Arts Experts Institute, up to 50% of all artwork in circulation is not authentic. The implications of this are significant, as certificates of authenticity become invaluable. Many critics have become frustrated with the archaic auction model and its lack of transparency. Moreover, the scarcity of information available during traditional exchanges introduces additional challenges. In aiming to increase the transparency of trading and investing in art, Artstaq uses its convenient digital features hoping to solve these issues. A data-driven Smart Advisor helps users to make more informed decisions for what to invest in and when. To evaluate the potential for each artist or artwork, the company relies on the input of dozens of art rating experts. Similar to the social trading and investing platform, eToro, Artstaq aims to leverage big data networks and state-of-the-art algorithms to help people overcome the barriers preventing them from investing in the art industry. By simplifying the process to enter the market, the opportunity to invest becomes accessible to a larger public. Artists and their collections receive ratings through an automated system, powered by unique algorithms. Users can easily sort through an index of artists and their art using a dashboard that can be filtered by things like market value, price, style, and artistic medium. Creating its own unique data, the platform offered by Artstaq introduces scalability to a traditionally rigid business model. As more content is uploaded, the product benefits from network effects and is strengthened as a result.